It's been fun refreshing the results page and seeing the votes come in. So fun, in fact, that we thought we'd share them with you. HONG KONG emerged as an early front-runner but once our friends in Europe woke up, BERLIN surged forward! But wait, here comes the surprise contender: MORE SEATTLE! If you haven't received your email voting link yet, never fear! The survey system only allows about 10,000 emails to go out at a time. If time starts running out and we find that people still haven't received their ballots, we will extend the deadline so everyone can have their voices heard. Around 20,000 people have yet to vote, so who knows what can happen? We're really excited about all of these places (no favorites here) and can't wait to see how it comes out! Never got an e-mail for the survey. I've checked my spam folder, and I've verified that I'm using the correct e-mail address. I got no e mail with a link to a survey. Never got an e-mail about the surveys. Whoops, it was classified as a potential phishing e-mail and bypassed my junk folder. Carry on! I never got a survey e-mail. Controversial or not, after ~2/5 of the votes were counted a trend did emerge. The final results will soon be made public, but we shouldn't expect any big surprises. HBS never updated the graph. There was a lot of discussion among backers and the Shadowrun community about whether or not HBS should have released any information about how backers were voting. It is possible that HBS did not update the graph in response to the controversy. I think the graph was just a snapshot at the time of the update. I don't think they intended to give us live stats. I'm not 100% certain that the vote was actually valid, as it seems a large amount of the backers did not get a vote. Also the above graph never moved from 15k votes and we have 36k backers, and I've refreshed this page several times in the last few days. Soooo.....shouldn't the vote be over soon? Chiming in as someone else that didn't get the survey. Check your "junk" or "spam" mail folders. I also haven't gotten the survey. Haven't received the survey either. Would have voted for Berlin. Haven't received the survey either. If anyone's listening, I wanted to vote for Berlin. I haven't received the survey, with less a little more then 12 hours left for it. Haven't gotten a survey yet. I never got the survey... I'd like to see more areas of the rest of western Washington, not just Seattle. What became of Bellevue? Everett? Tacoma? ... Renton, Ballard, Kent... Enumclaw. :3 -- Spokane, Yakima, Wenatchee? Sorry for double post, found my survey letter in spam folder. Haven't received my survey either. It's 9pm on May 15th in my timezone (East coast of Australia), and I haven't received a survey e-mail. Hmm, yet to receive mine but there is still another day of voting to go, hopefully I'll get the email tomorrow. 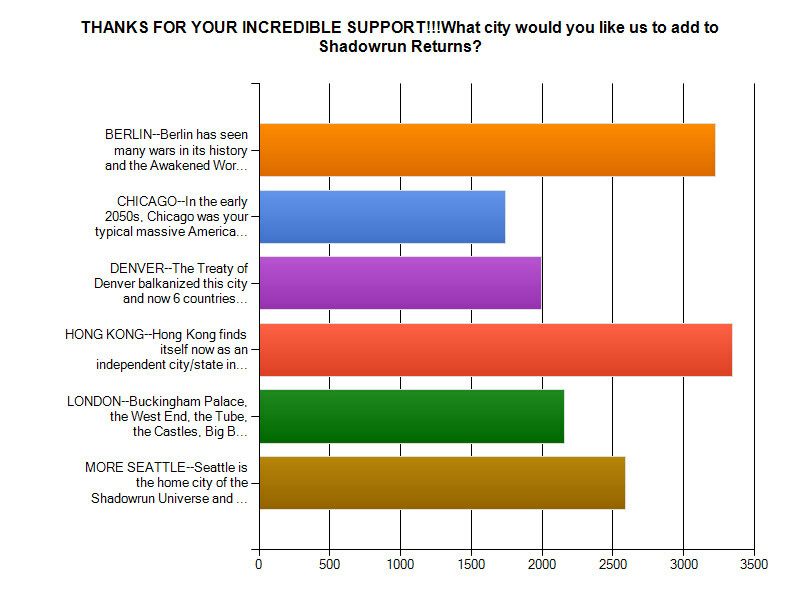 WOOT LETS GO BERLIN, seriously too many games and movies have depicted Hong Kong its about time some European cities got some love. How about an update on the poll results fellas? For serious kids, check those junk mail folders. Now someone needs to name an actual racehorse "More Seattle". Check your junk mail filter if you haven't received the email. Gmail classified the survey email as spam for me. I've not received the email for the survey either. I sure hope I get it before voting closes. Really really hoping for Berlin. Cyberpunk games featuring China/Hong Kong: All of them. I saw int he older comments the idea, that after the top 2 are chosen, they should run a second vote for just those 2 cities. This seems like a good idea to me, since it would allow everyone to have a pick of the new city. Hope you guys at Harebrained Schemes think about doing that.